Following the inscription of Stećci- Medieval Tombstone Graveyards on the World Heritage List, the management system for this serial property is organized through efficient vertical and horizontal coordination among the participating States and their national, regional and local authorities, communities, and experts. The International Coordination Committee is comprised of experts and representatives of each of four participating States, and it is responsible for all activities concerning necropolises, including, but not limited to, developing common strategies, principles and standards (conservation, capacity building, exchange and sharing of research results, communication strategy, presentations, etc.) which are important for the quality management of the sites. The International Coordination Committee is also responsible for the use of the World Heritage property logo. National organizational structure brings together regional and local authorities in each country, implements measures approved by the International Coordination Committee and develops activities specific to each of the states. Each state is responsible for the protection, conservation and management of the necropolises with the stećci located on its own territory, in accordance with strategies set out at the transnational level. Site management (Management Plan download – BIH, CRO, MNG & SRB) is responsible for managing the individual sites, for the implementation of measures in the site and development of the special, individual action plans for the site, depending on the needs and the state of conservation of the site. Each of the states has developed a site managing system in accordance with its own legal and administrative systems, and the Management Plan. 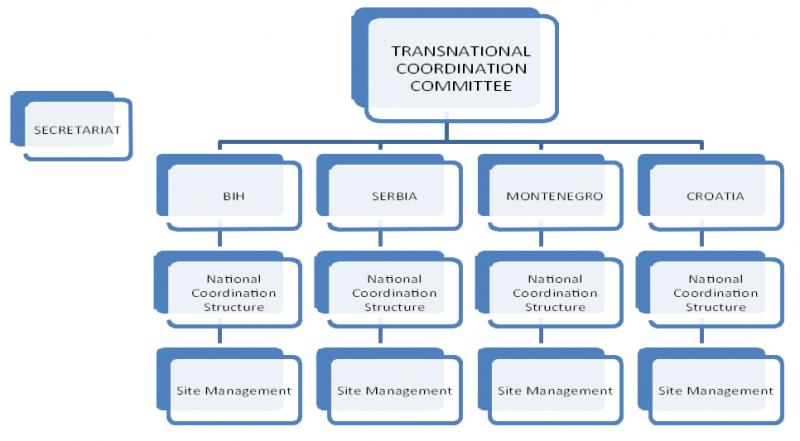 In Bosnia and Herzegovina, in particular, due to the complexity of the administrative requirements, institutional and legal framework for the management of the heritage, and number and distribution of the necropolises with the stećci tombstones, a more complex coordination structure is necessary, which includes national and entity level Coordination Committees. Site Managers are appointed by municipalities in whose territories necropolises with stećci are located. Site Managers are responsible for the regular maintenance of necropolises with stećci, regular monitoring of the status and reporting to the Coordination Committee and the respective entity heritage protection service on the results of monitoring, control visits to the site, and the implementation of actions identified within the individual management plan for that necropolis. Secretariat of the International Coordination Committee is established to facilitate the work of the Committee and flow of information between all participating States, and it maintains the communication with the World Heritage Centre. All questions regarding the protection and management of the necropolises with stećci inscribed on the World Heritage List should be directed to the competent authorities (pdf lists below) of Bosnia and Herzegovina, Croatia, Montenegro, and Serbia, or the Secretariat of the International Coordination Committee. The Secretariat can be contacted by email jelena.dzomba(at)mcp.gov.ba or phone +387-33-492-598.